During the dark and challenging times in our life, it is easy to give up. We often become discouraged and frustrated. 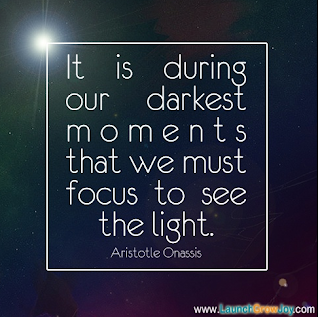 But, it is during these times when we need to focus our attention to the light. We need to reach out to our family and friends. We need to seek for help. We need to find the beauty in life and the blessings we receive each day. Don't let those dark and discouraging moments tear you down. Focus on the light. Focus on what you have been given and the many blessings you enjoy.